We also have a comprehensive two-year aspiring instructor program, which is run in-house by our head instructor. With a Bachelor of Education Michele understands that there are different ways to work with individuals (those with two feet and four!) to achieve results and goals. Her ‘hands on’ experience with new students at CBS and her own experience in training and working with Taj has led her to be fully committed to force free training. She has a particular interest in understanding dog behaviour and she values training that encourages confidence, self-esteem, self-control and fun. Having experienced all sorts of different training styles having had German shepherds for many years, Heather was really happy to find the use of positive reinforcement training while working at Guide Dogs for the Blind in the UK. 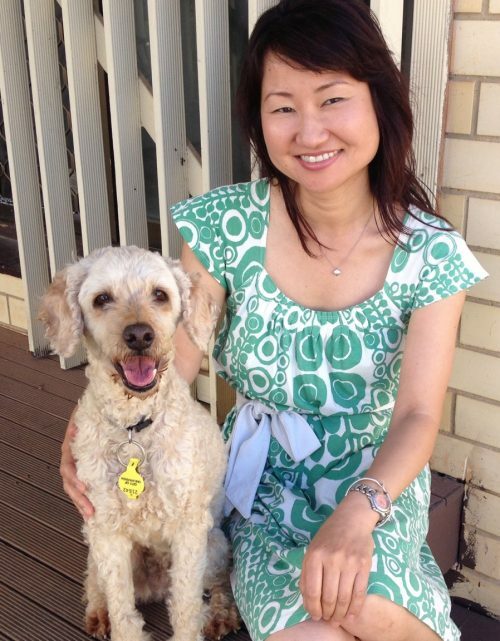 It is from them that she adopted her last dog Iris, who travelled to Australia with her in 2012. Heather has since been working at the RSPCA as an education coordinator (particularly as an advocate of their Lead by Example campaign) while continuing her love of training with CBS. She can often be seen out and about at schools and community groups, previously with Iris who was a wonderful RSPCA education advocate until her passing in January 2017, and now with her new partner in training (slowly! ), Paddy. Heather was very happy to qualify as a PDA Instructor with CBS last year and has very much enjoyed the challenge of taking on her own classes, helping people build relationships with their own dogs. In 2018 she hopes to complete her DogNostics Dog Behaviour Consultant Diploma and also undertake both the CTT-A qualification and the clicker training Competency Assessment Program, finally overcoming her fear of being in front of camera. Gaby is a vet from Ecuador in South America. She joined CBS as an aspiring instructor in 2017 and is currently assisting with bronze classes. She is enjoying the opportunity to learn so much more from CBS. Gaby love animals, especially dogs and cats and used to have a pug, a ginger cat named Obama and another ginger cat named Bella, whom she adopted in Galapagos while working for the Government managing stray urban animal population. Her main areas of interest are animal behavior, physiotherapy and natural medicine. She loves living in Adelaide while her partner completes studies, and works at Petstock and Dogcity Day Care. If you see her there she’s always available for a chat! Margaret has a keen interest in Animal Behaviour and especially in understanding more about our canine friends. She has volunteered at the RSPCA for a number of years and is now with the Behaviour Team there. This involves helping the more anxious and nervous dogs who are struggling to adapt to life in the shelter. This led to Margaret first fostering then adopting her rescue dog Molly, a German short-haired pointer/heeler cross. She has completed the Aspiring Instructor Program at CBS and is a member of the Pet Professional Guild. She continues to further her knowledge by ongoing study. Felice completed her Certificate IV in Veterinary Nursing in 2011 and worked across South Australia and Victoria before settling in Adelaide. She has a keen interest in animal behaviour and positive reinforcement training and has completed the Certificate IV in Companion Animal Services with the Delta Institute. Felice adopted golden retriever Bella, who has obtained her B.A. for dogs through the CLASS program. Kate has a menagerie of animals (currently including her dogs Monty, the border collie cross and Alaska, the blue heeler cross). She loves seeing the difference force-free training can make to the lives of dogs – including both her ‘problem’ dogs – and their guardians. Kate has completed the Delta Institute’s Certificate IV in Companion Animal Services, and the Professional Canine Trainer and Canine Training Technician accreditations through the Pet Professional Accreditation Board. In June 2017 she received a scholarship to study the Dog Behaviour Diploma with Dognostics Career Center. She also has a Bachelor of Arts in Politics and a Graduate Diploma in Journalism. In a previous life, Kate has been a police officer and government media adviser but has recently quit her day job to concentrate full time on her dog training business offering private consultations, puppy pre-school and group classes. She is also approved by the Dog and Cat Management Board to undertake greyhound assessments. Zoe has always had a love for German shepherds, ever since her family brought home their first rescue GSD Rex when she was five years old. Working as a scientist by day, Zoe volunteers her time at CBS in order to further her knowledge of science-based force-free training, and thoroughly enjoys the challenges each individual dog has to offer. Jess is an aspiring instructor with CBS. 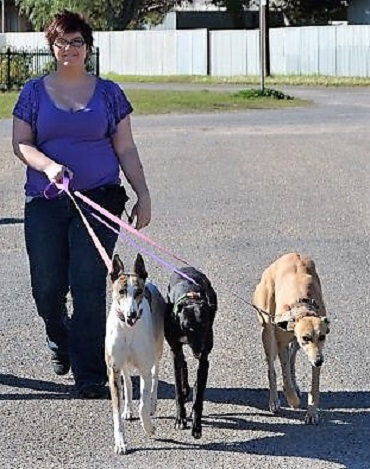 She has previously volunteered with the Greyhound Adoption Program in South Australia and has fostered more than 30 greyhounds over the last seven years, three of whom became permanent residents. Jess has a certificate in Foundations of Dog Training through the Karen Pryor Academy and has completed a Certificate II in Animal Studies. She is completing the Certificate III Companion Animal Services in 2018 and has recently accepted a position as an animal attendant at Beau's Pet Hotel. Her goal at CBS is to help both the guardian and dog bond and understand one another, as she believes that one of the greatest gifts for two social beings is to be able to communicate. 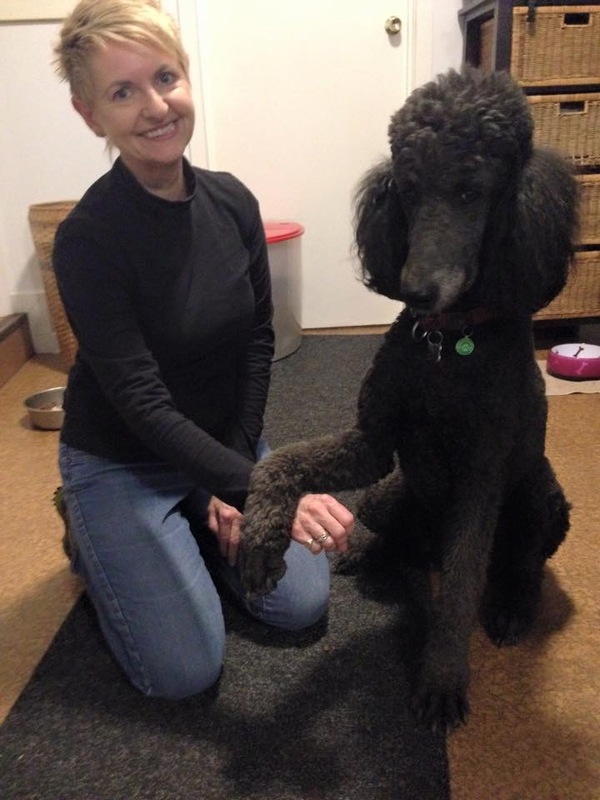 Susanne holds a Certificate IV in Companion Animal Services, is a Professional Member of the Delta Institute and the Pet Professional Guild of Australia, is a member of the Association of Pet Dog Trainers Australia and is on the RSPCA Force Free trainers list. 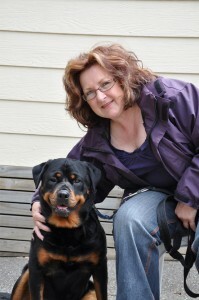 Mila, a very anxious, fearful and reactive rottweiler, was responsible for bringing Susanne on her journey to help other owners train and understand their dogs through humane and scientifically-based methods. Mila was rehabilitated through positive reinforcement, force-free training methods and lived a full life with two other rottweilers, Gunter and Piper. Piper (pictured) gained her Canine Good Citizen award through the Delta Society. Susanne runs weekly puppy pre-school at Payneham, Walkerville and Stephen Terrace veterinary clinics. 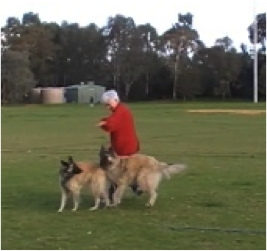 She also teaches group classes and on Saturday mornings runs dog reactive classes at Unity Park, Pooraka. She also offers private in-home behavioural consultations and training as part of her professional dog training services. Susanne is also approved by the Dog and Cat Management Board to train dogs declared menacing and/or dangerous. Petra holds the Professional Canine Trainer accreditation through the Pet Professional Accreditation Board and has a Bachelor of Science (Hons), with a specialisation in animal behaviour. 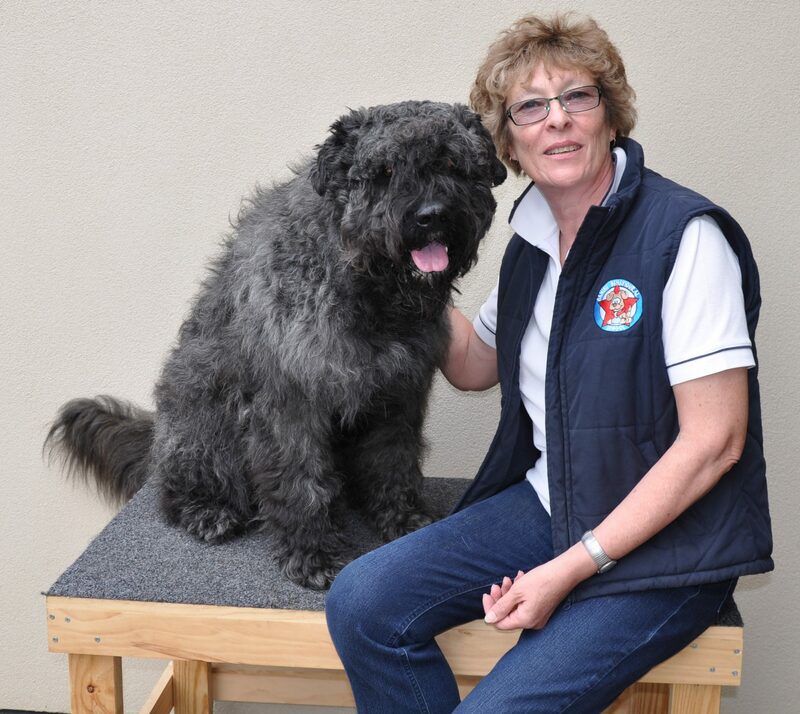 She has been involved in the dog training industry since she was 12, when her mother, Mim Edwards, started Adelaide Pet Dog Training. She is very passionate about animal behaviour and welfare and the amazing achievements and relationships that force-free training facilitates. 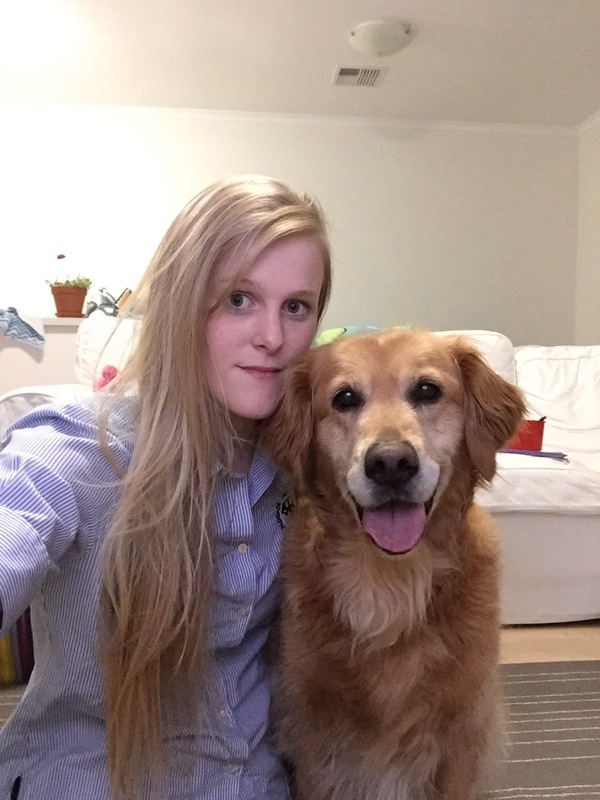 Petra is currently undertaking a PhD, analysing how dogs experience veterinary clinics and looking at strategies to reduce or prevent stress. She is thoroughly committed to professional development and loves to learn more about learning theory, animal behaviour and force-free training. Petra regularly attends conferences, seminars and skills-based workshops to keep up to date with the latest in research and best-practice methods. Petra and her partner Chris share their home with their rottweilers. Gus and Gwen are cheeky, boisterous and keep Petra on her toes, but are valued and much-loved family members. Petra hopes all pet owners are lucky enough to share a similar experience. Sarah was first introduced to positive reinforcement training in 2005 when she enrolled her pug/cavalier cross, Portia, into a puppy pre-school with Bev Clark at the Norwood Veterinary Clinic. Sarah’s Australian bulldog Hef joined the family in January 2009. 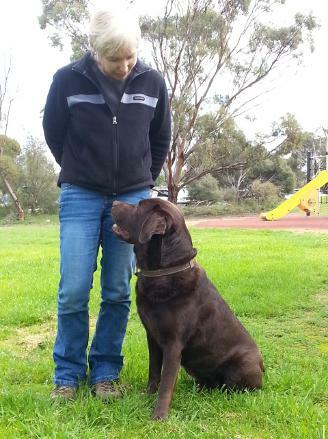 Sarah noticed Hef had some aggressive tendencies so she promptly enrolled him into a puppy course at Adelaide Pet Dog Training and then the Canine Companion course. In training Hef, Sarah has seen firsthand the power of using positive reinforcement training methods. Sarah enjoyed the training so much that she started volunteering at Canine Behavioural School as an assistant instructor at the end of 2009 and started taking classes as a fully-fledged instructor in mid-2011. 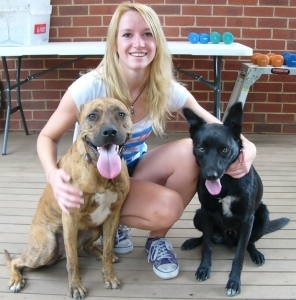 Sarah also volunteered at the RSPCA whilst she was studying at university. Sharon has been in the pet industry for more than ten years. In the last four years she has taken an interest in animal behaviour, welfare and positive reinforcement training. 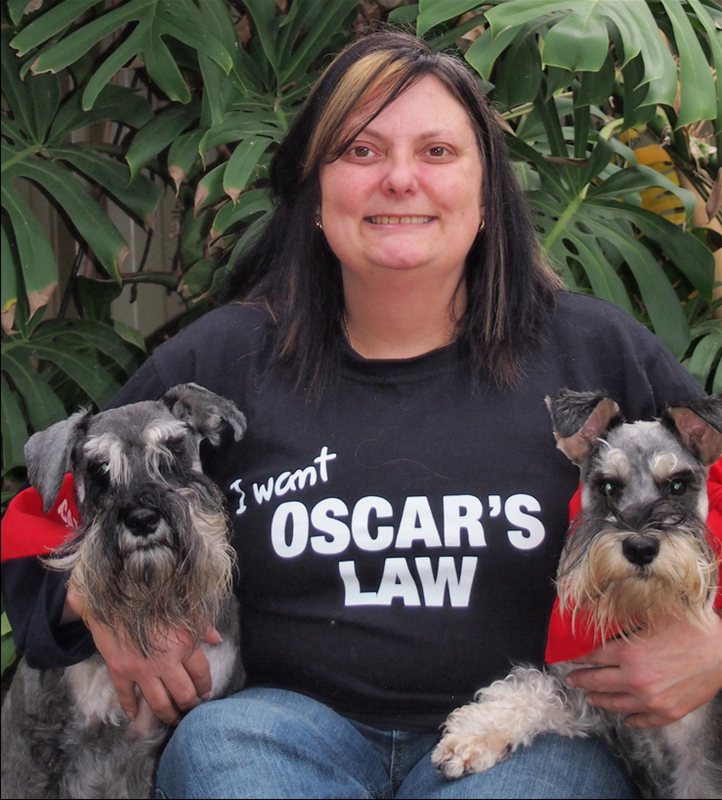 Sharon owns two mini Schnauzers named Blitzen and Ava, who have both obtained their Delta Canine Good Citizen Award. Ava has also obtained an advanced Trick Dog title and Blitzen currently holds a novice title. 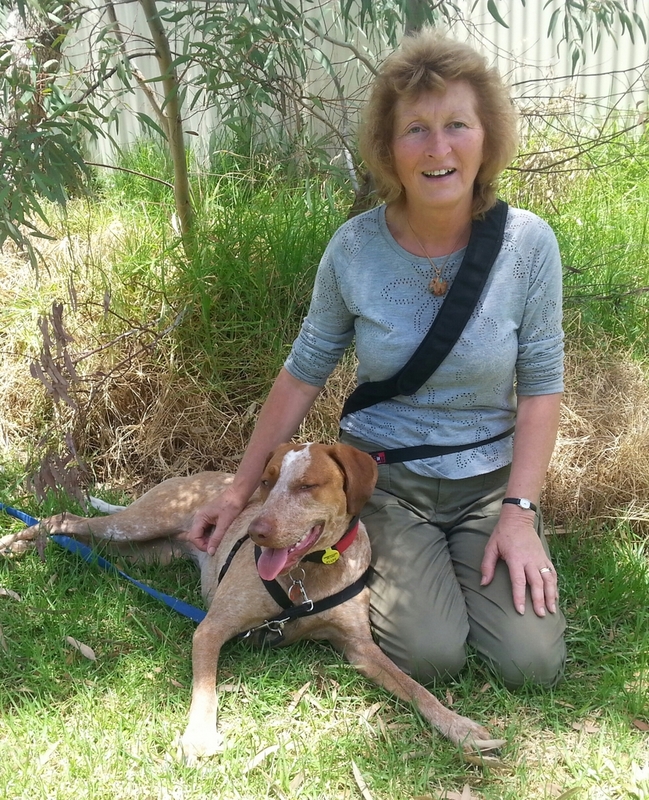 Sharon has just completed the Certificate IV in Companion Animal Services through the Delta Institute and the aspiring instructor program at CBS. She loves positive reinforcement training and helping guide owners and their fur kids through their training. Sarah has always been surrounded by animals (including dogs, cats, rabbits, guinea pigs, chickens and ducks) and from a very young age wanted to work with animals. 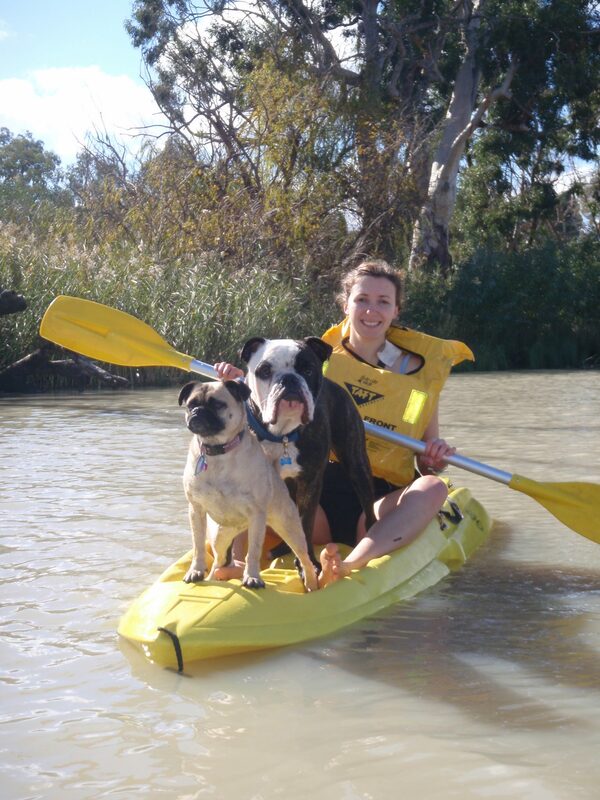 Sarah began by doing work experience and becoming an assistant with Adelaide Pet Dog Training in late 2009. After deciding to develop her knowledge and dog training skills further Sarah started assisting at CBS in late 2011 and is now an instructor. Sarah would especially like to be able to help people understand their dogs’ behaviour and help them form a strong bond with their pet. During the day, Sarah works as a mental health nurse. 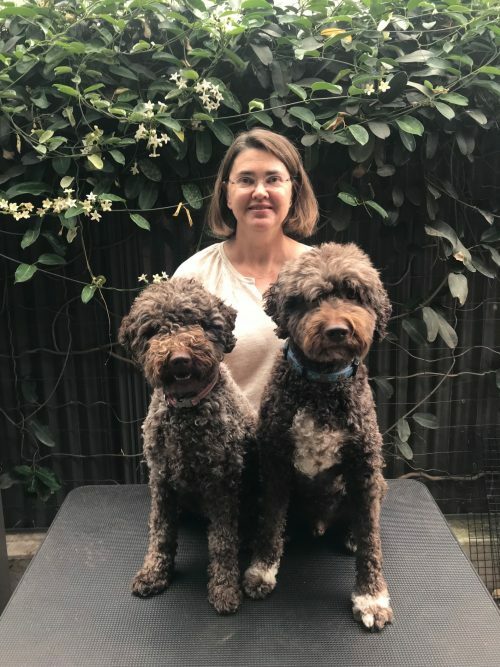 Mandy has had rescue dogs with anxiety issues as a result of their previous living conditions and lack of socialisation; these issues sparked her interest in dog training and behaviour. Having done a little dog training in the past with previous dogs, Mandy knew that to really help her dogs she would need a training method that was both gentle and positive. 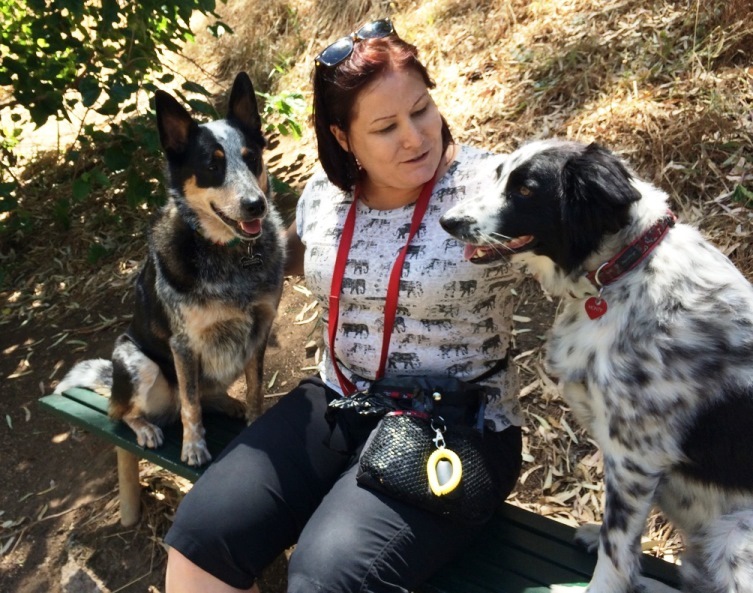 Mandy joined CBS in 2013, and in mid-2015 became a CBS instructor and completed the Companion Animal Sciences Institute’s Diploma in Dog Behaviour course. Mandy's other interests are search and rescue dogs and assistance dogs and is currently training her new dog Tex to be an urban search and rescue dog. Mel is an aspiring instructor with CBS. 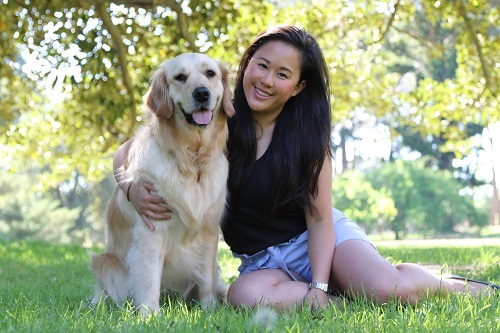 Her journey started out as a CBS student with CBS when she welcomed her golden retriever Mya in 2015. She continues to work through the Pet Dog Ambassador syllabus with Mya. She looks forward to working with the CBS trainers to learn about more positive reinforcement training techniques and deliver fun-filled and enriching classes. Jeannine has always enjoyed a life with animals and cannot imagine life without them – especially dogs. She has had several mixed breeds who always seemed to find her when they needed a home, although in recent years it was curly coated retrievers that moved in. One of these, Bailey, helped introduce Jeannine to a deeper and more meaningful understanding of canine behaviour. Jeannine is passionate about positive reinforcement training and love sharing this with others. Jeannine has an honours degree in Education (Junior Primary and Primary) and spent several years in the education sector before crossing to the other extreme, where she now works in the aged care sector. 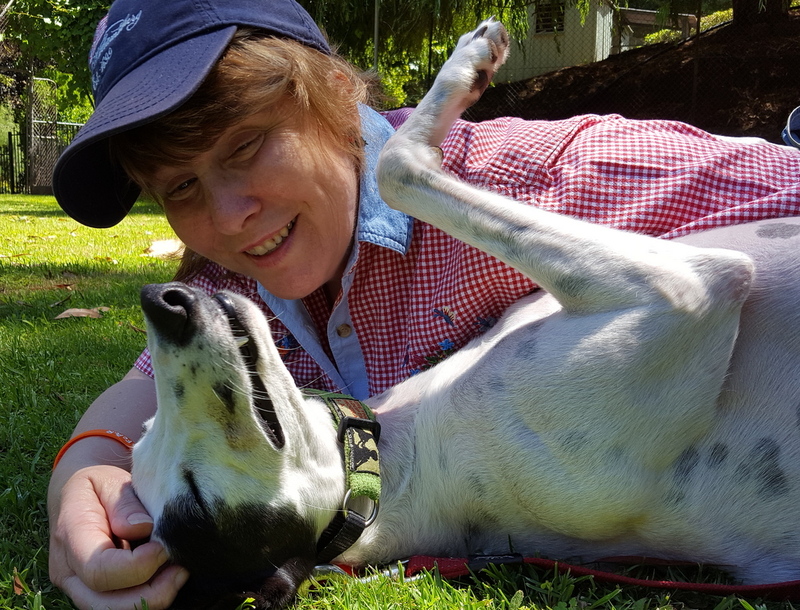 Currently Jeannine is the guardian of a lively greyhound called Jacki, who literally bounded into her life. Through Jacki, Jeannine’s education continues and they are both currently having a ball learning Dances with Dogs Freestyle and Heelwork to Music. A firm believer in lifelong learning, Jeannine has completed aspiring instructor program at CBS and is near the completion of her Certificate in Canine Nutrition through the Companion Animal Sciences Institute. Jeannine plans further studies in nutrition and canine fitness. Between her full-time job and other hobbies, Jeannine trials new recipes for her Happi Chappi Bakery, which she runs baking treats for dogs. 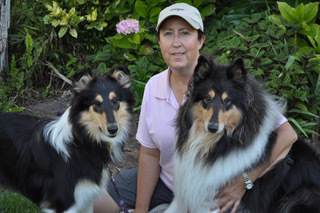 Deb has studied canine behaviour extensively, attaining a Diploma in Dog Training and Behaviour Consulting, another in Animal Behaviour Science and Technology, each from the Companion Animal Sciences Institute and a Diploma in Canine Behaviour from the International School of Canine Psychology and Behaviour (all with distinction). She holds a Certificate IV in Dog Behavioural Training from the Delta Institute and the UK based Competency Assessment (CAP) 1 & 2 qualification again with distinction. Deb is also a Professional Canine Behaviour Consultant with qualifications through the Pet Professional Accreditation Board. As well as volunteering her time with Canine Behavioural School, Deb is a board member of the Pet Professional Guild (PPG), serving also on the boards of Doggone Safe, the Companion Animal Sciences Institute and the Association of Animal Behaviour professionals. 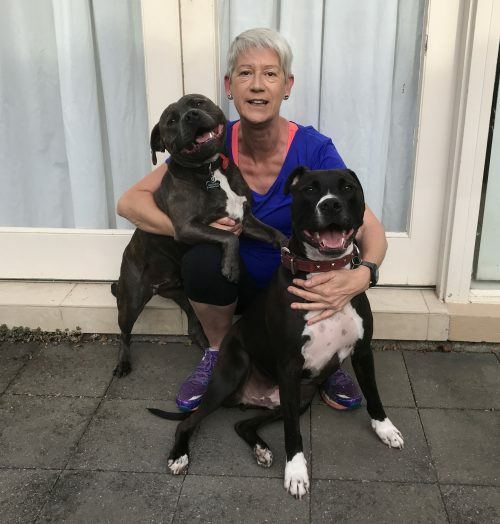 Deb is a committee member of the RSPCA SA ‘Lead by Example’ campaign, is on the PPG steering committee and was chaired the Australian committee that created the Pet Dog Ambassador Program. Recently Deb has joined the international faculty of DogNostics Career Center in the US. Deb has also been awarded the Association of Pet Dog Trainers ‘Trainer of the Year Award’ and their Susan Wilkins Achievement Award. 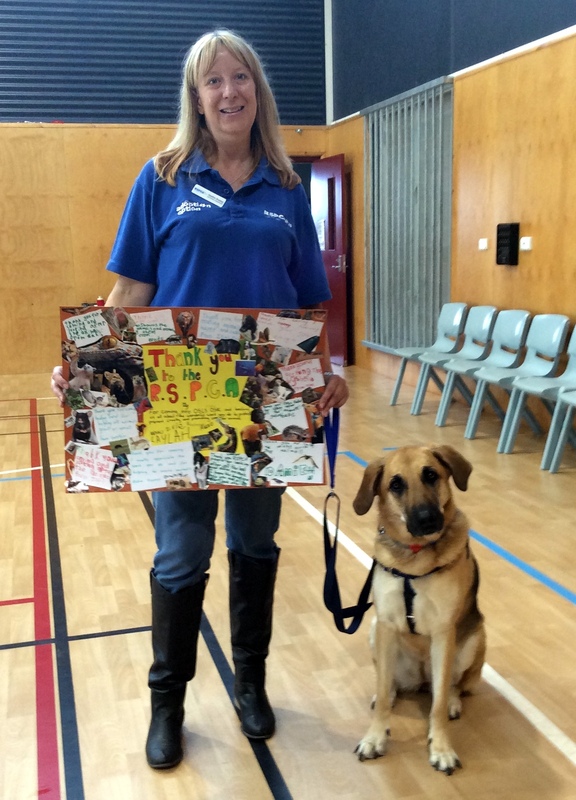 Deb has served as CBS Head Instructor for nine years and is currently the Senior Volunteer Trainer, a position that continues her work of teaching the CBS Aspiring Instructor Program and preparing them to undertaken Pet Professional Accreditation Board qualifications. She shares her life with husband Arnold, Mace the Bouvier des Flandres and a little rescue Griffon Bruxellois called Roux. Kirsty has always had a passion for animals and originally started in the animal industry working with horses. From this she realised her passion was in canine and equine behavior. Kirsty was introduced to positive training methods when dealing with her special needs American Staffy, Major. She also lives with her mum’s English staffy, Oshka, and an Arabian horse called Eddy. Kirsty has run puppy pre-school and is currently completing the Delta Institute Certificate IV in Companion Animals Services and the aspiring instructor course at CBS. She is employed in the service dog industry. Sharon has had dogs all her life and helped her sister with breeding and showing her dogs (golden retrievers, English setters and Skye terriers). It was when her daughter brought an American Staffordshire terrier into the house in 2012 that she discovered the wonders of positive reinforcement training and her love of bull breeds. 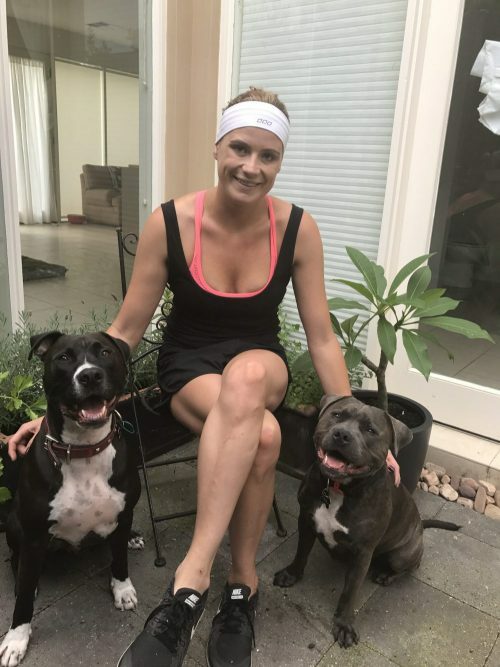 This journey has continued with her own English Staffordshire terrier, Oshka, and also helping her son with his young English Staffordshire terrier Ashy. After 25yrs in nursing Sharon has decided to follow her passion and is currently completing her Delta Institute Certificate IV in Companion Animal Services and is an aspiring instructor at Canine Behavioural School. She is a member of the Pet Professional Guild and Association of Pet Dog Trainers Australia. Steph was first introduced to force free training while doing work experience as part of her animal studies course. 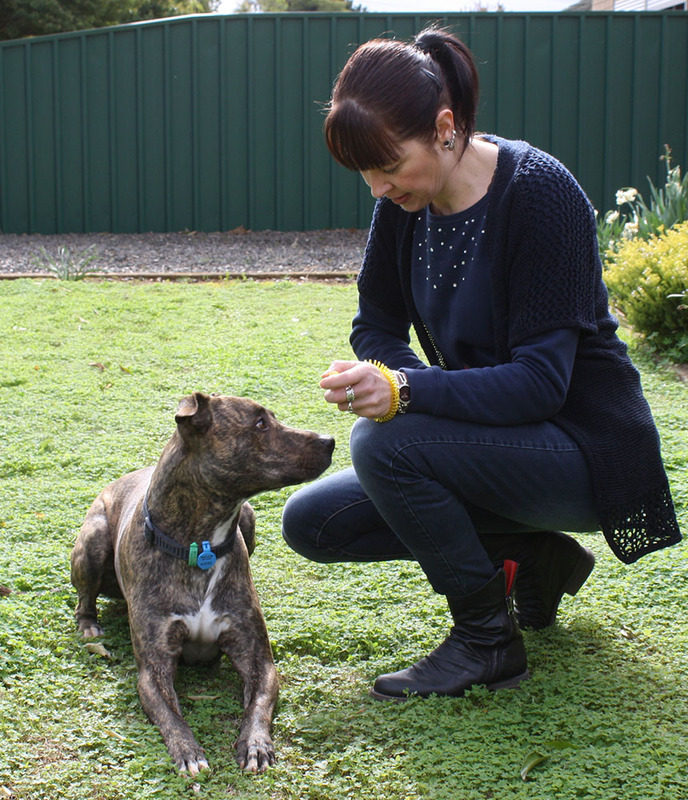 She experienced first-hand such great results with her staffy cross, Buddy, that she was keen to further her knowledge and understanding of this training method. Buddy entered Steph's life as a young dog, full of energy and enthusiasm, but also quite rowdy and undisciplined. Through rewards-based training, Buddy has come a long way. He is now much better behaved and well mannered, has successfully completed both Bronze and Silver classes at CBS and Steph is looking to complete the Gold and Diamond classes with him in the near future. 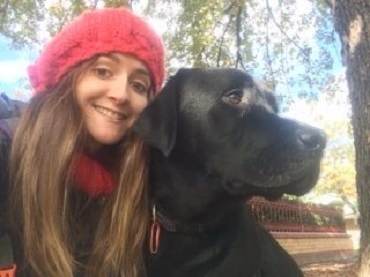 Steph is a registered dog walker and pet sitter, she has experience in doggy daycare, holds a Certificate II in Animal Studies and has completed the CBS Aspiring Instructors in-house program. She has also attained the Canine Training Technician accreditation through the Pet Professional Accreditation Board. 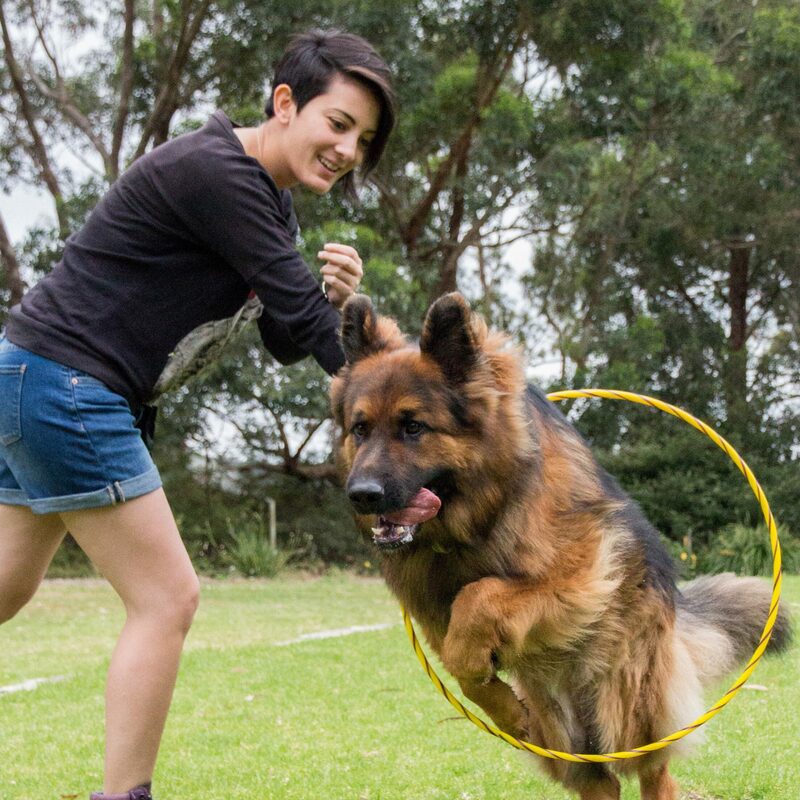 Steph is a member of the Pet Professional Guild Australia and is passionate about bringing more awareness to the general public about the benefits of force free training. She looks forward to sharing her knowledge and giving people the skills to have happy and well-mannered companions. Chris’s interest in dog training started when she joined an obedience dog club to train her first family dog, a basset hound, in the 1980s. Returning there with subsequent dogs, she ultimately became an instructor herself, some 16 years ago, which combined two of her interests: training people (which she did in her work life) and dogs. To enhance her skills and knowledge she gained a Certificate III in Dog Behaviour and Training in 2009. Learning is ongoing; since then she’s attended various seminars, read a copious number of books and observed other trainers. Currently she’s taking part in CBS’s comprehensive aspiring instructor’s course. Dogs are also great teachers, each of Chris’s dogs have have taught her a great deal and her current dog, Berkley the Labrador, is no exception. His passion for sniffing has led Chris to take up tracking and dabble in a bit of Nose Work, which have proven to be fun for both. With hindsight, Chris thinks this is something she should have done with the basset! Vicki grew up with Labradors and has always had cats in the household. Her family now includes a ginger tomcat and two lagotto romognolos, each with their own unique personalities. Raffa has achieved his CBS Diamond class certificate and together Vicki and Raffa won Team of the Year in 2014. He and Vicki are now training in Canine Urban Search and Rescue. Silvie is a shy dog who finds the world a bit overwhelming but finds her inner mojo when running wild and free at the park or the beach. Both dogs have taught Vicki so much about canine behaviour and cognition. Vicki is a qualified teacher and librarian and is now embarking on her third career by gaining qualifications in dog behaviour and training with Dognostics Career Center. Vicki also volunteers at the RSPCA. She is a member of the Pet Professional Guild and is passionate about teaching people how to use force-free training to build a positive relationship with their dogs. Tracey is a graduate of the Karen Pryor Academy Professional Dog Trainer Program (KPA CTP) and has completed the KPA Puppy Start Right for Instructors course, the Dogtec Professional Dog Walkers certification and the Pet Tech CPR and First Aid certification. She is a member of the Association of Pet Dog Trainers. Tracey runs puppy pre-school classes with the aim to teach the importance of socialisation and how to do it effectively so that puppies are given every opportunity to grow into well-adjusted and confident dogs. She takes group classes and in-home consultations, identifying individual needs and working towards personal levels of success. She is committed to using positive reinforcement techniques and principles and believes the key to effective training is to understand how dogs learn, how they communicate and how to communicate effectively with them. Tracey continues to attend seminars, workshops and conferences to build on her knowledge base, hone her training skills and to keep up-to-date with the latest developments in this field. 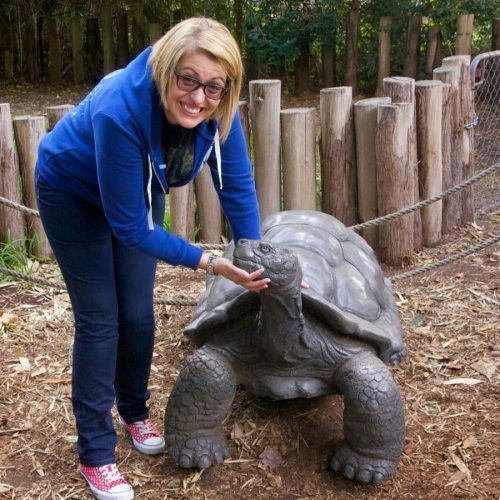 Tenelle has always had a keen interest in animal behaviour and welfare. She has gained a Certificate IV Veterinary Nursing in 2011 and a Certificate IV Companion Animal Services (Delta Institute). She also has a Graduate Diploma in Education. As an instructor at CBS, Tenelle combines her passion for teaching humans and improving the lives of animals. Tenelle shares her home with a deaf boxer, a one eyed Pomeranian mix, a turtle, a couple of chooks and two rabbits. Naoko has been a passionate advocate for animal rights and welfare for many years, and her interest in ways to tackle pet over-population and abuse/neglect led her to dog training. She believes that understanding how dogs learn, think and behave can help strengthen the guardian and dog relationship and prevent a lot of behavioural issues which can lead to surrender and euthanasia of the animal. 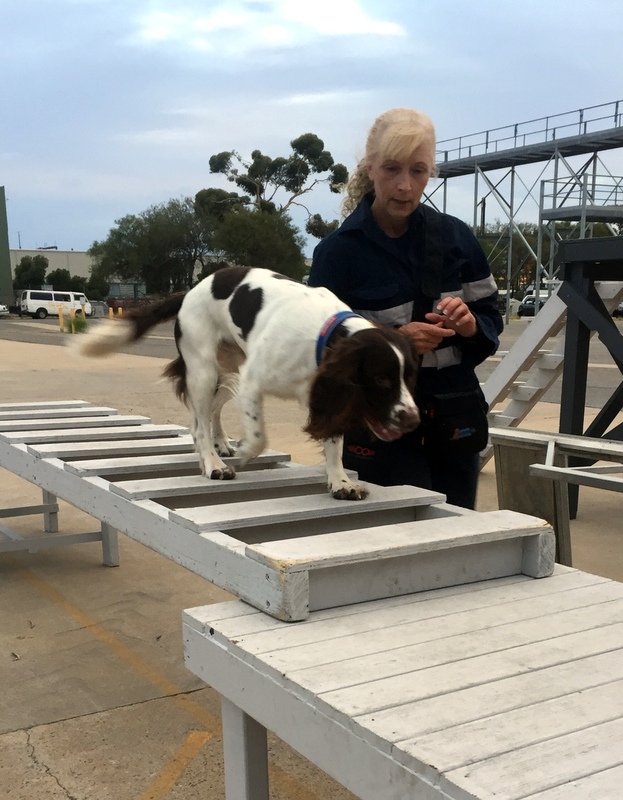 She is currently undertaking a Certificate IV in Companion Animal Services with the Delta Institute, and also volunteers with the behaviour team at the RSPCA. She and her young son are hoping to adopt a rescue dog soon. Amanda is an Associate K9 Nose Works® instructor working towards her Certification with the National Association of Canine Scent Work (NACSW). 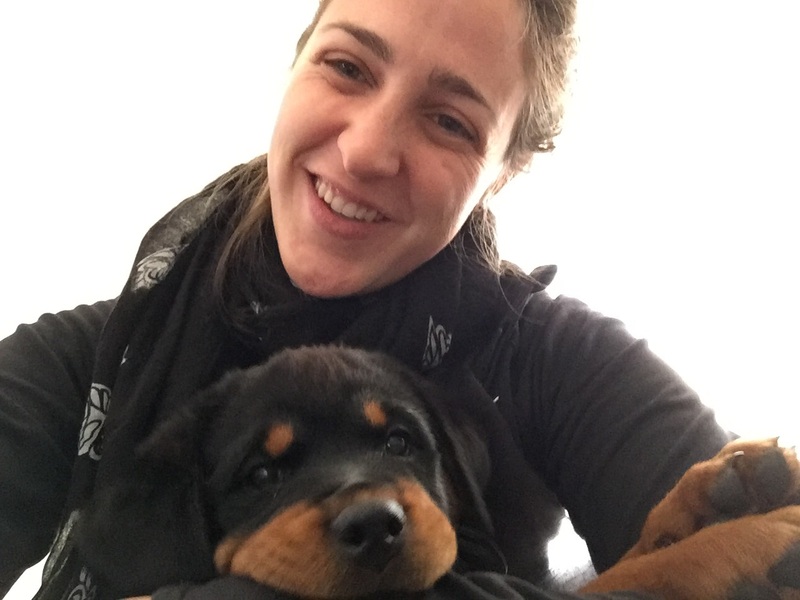 Amanda has completed a Diploma in Canine Behavioural Science and Technology from the Companion Animal Sciences Institute, a Diploma Canine Behaviour Consultant from DogNostics Career Center and the Puppy Start Right Instructors Course with the Karen Pryor Academy. Amanda is a member of the Pet Professional Guild Australia, Association of Pet Dog Trainers Australia and Australian Canine Scent Work. She joined CBS in 2012 as a student and continues to volunteer with CBS as an instructor. Amanda also instructs and assists with group classes for her local veterinary clinic. Amanda lives with her much loved two rough coat collies. Her passion is learning about dogs and to assist people to understand them and enrich their dogs’ lives. 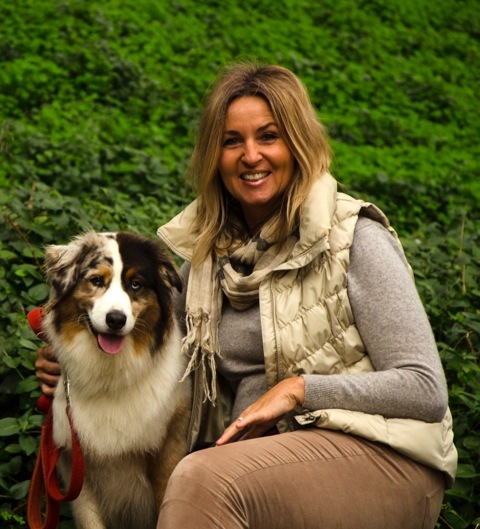 Ilona Wright is one of the founding members of Canine Behavioural School and is one of our most experienced instructors, with 40 years instructing behind her. These days her interests lie in taking classes for dogs with issues, where the class content is tailored to the dog/guardian needs, and the more advanced work of Dances with Dogs (DWD) which is essentially obedience with attitude choreographed to music.